Our education system is the bedrock of Minnesota’s prosperity. A strong education system means a lifetime of success for our children, a capable workforce, an innovative economy, and healthier and safer communities. We must continue to improve the quality and effectiveness of our education system for all learners. Investments in early childhood learning are pivotal to our future. According to the Federal Reserve Bank of Minneapolis, “well-focused investments in early childhood development yield high public returns, as much as $16 to $1.” That is why I voted for all-day kindergarten and why I support early childhood education scholarships. We are closing the achievement gap by targeting the families that need it most to get kids prepared for kindergarten and lifelong learning. A college degree is a necessity in today’s global economy. As a member of the Higher Education committee, I’m working to break down the costs and other barriers to getting a college degree. According to a report by the Georgetown Public Policy Institute, by 2020 74 percent of jobs in Minnesota will require some postsecondary education. This is why I voted to freeze tuition at our public colleges and universities and to increase funding for the State Grant Program. I also support apprenticeship programs that connect students directly with employers. These programs teach the skills necessary to meet the demands of tomorrow’s workforce, and grow personal income for workers. Our state economy is stronger with high-skilled workers and innovators. That’s why I will work to provide stable funding for our public schools and our state’s colleges and universities. When our educational system is working, Minnesota is prospering. 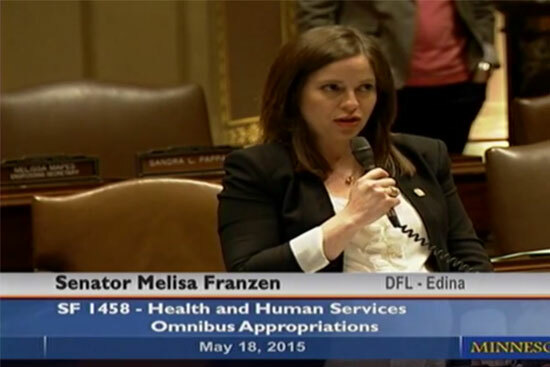 My work as Vice Chair of the Health and Human Services Committee touches every Minnesotan. My goal as Vice Chair is to build upon Minnesota’s track record and leadership in providing the best health care in the nation. A top priority for me is to ensure that seniors and our most vulnerable residents have access to the high-quality care they deserve. While providing these vital services, we must also be accountable for health care spending to make efficient use of our resources. I believe in expanding evidence-based programs like home visiting and supporting basic programs such as the Minnesota Poison Control Center. This session I was the chief author of the Minnesota Stroke System legislation. The Stroke System will save taxpayer dollars and help people live their lives to the fullest. I’m dedicated to keeping health care affordable and accessible for all Minnesotans. The cost and availability of prescription drugs impacts the daily lives of Minnesotans, especially seniors living on fixed incomes and people living with chronic illnesses. I’m taking the lead on reforming the prior authorization process so patients can access prescription medications quickly when they need them. I also authored legislation to make pharmaceutical drug pricing transparent, and to reduce the cost of prescription drugs that Minnesotans rely on. I am a strong and vocal advocate for funding Minnesota’s transportation system to meet the present and future needs of our metro and rural communities. I am committed to a comprehensive, multimodal system that includes roads, bridges, and transit. A world-class transportation system is vital to Minnesota businesses and our competitive standing in the global economy. Strong transportation infrastructure supports a vibrant business climate and attracts talented workers to our state. Transportation investment serves millennials, seniors, and people with disabilities who rely on public transportation to stay mobile and productive in our community. Investments in transportation benefit all Minnesotans. Whether you are a business owner that distributes goods or services throughout our state, a cabin owner that travels on weekends, or a daily commuter to work or school. Our transportation system is overdue for investment. I will continue to work to fight for smart investments to maintain and improve the transportation infrastructure that reduces congestion and facilitates the efficient flow of commerce in every corner of the state. As a small business owner and a former Target attorney, I understand the challenges of building a successful business. This is why I authored legislation to reduce business property taxes statewide, lower the unemployment insurance tax, and minimize the burdens of regulation in the business auditing process. I also understand the importance of planning and saving for future economic downturns. That is why I support an automatic reserve in the event of a budget surplus, and authored legislation to include inflation in our state budget forecast. I also believe business and labor are not mutually exclusive. That’s why I support sensible policies that support working families including paid family leave and equal pay for equal work. I proudly supported the Women’s Economic Security Act and increasing Minnesota’s minimum wage. As our businesses grow and our economy steadily improves, so do the lives of all Minnesotans. I will continue to strive to incentivize growth in our economy and create a business climate where innovative ideas can thrive. As a Minnesotan, I appreciate the natural beauty that makes this state such a wonderful place to raise a family. Each time we travel to our family cabin, I am reminded that fresh air and clean water are priceless resources that need our stewardship and protection. As your state senator, I voted for the Clean Water, Land and Legacy Bill and the Clean Water Accountability Act to protect these resources so future generations can count on a clean, healthy environment. I also want to ensure that we utilize natural resources in a responsible manner. Minnesota’s economy is rich and diverse. We all use and benefit from our natural resources whether it is agricultural products, timber, or raw materials. We must give careful consideration to stewardship and sustainability when we use these resources so future generations can enjoy the abundance Minnesota offers. As your Senator I will work to make sure our food, water and air are safeguarded for the future while giving our economy the resources to grow for all Minnesotans.